The Rt Hon Maria Miller, MP for Basingstoke. 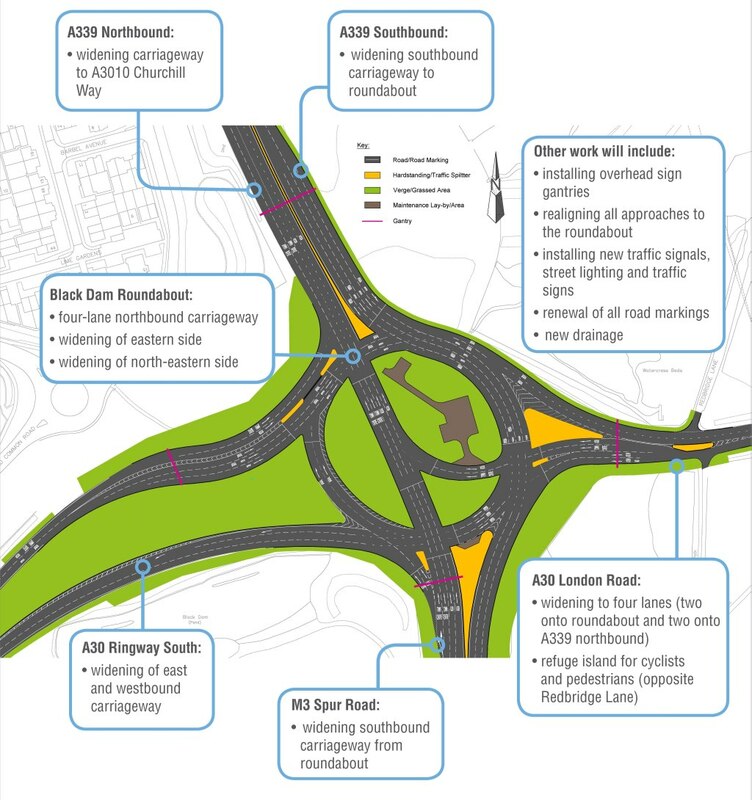 The £10,000,000 rebuilding of Black Dam roundabout in Basingstoke, next to the M3 junction 6 interchange, will result in an intersection that is unsafe for people who choose to cycle and walk, according to the Highways Agency. The decision to make the intersection unsafe flies in the face of official Department of Transport statements and official guidance which emphasises the importance for road designers to accommodate the needs of cyclists and pedestrians in road design. 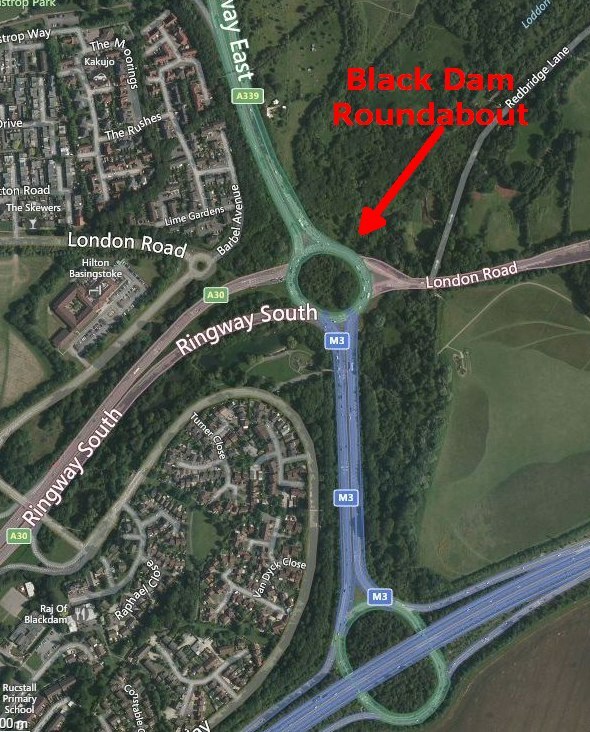 The Black Dam roundabout (map) sits between the Ringway South and London Road, which continues on to Old Basing and into the town of Hook. However, the £10m make-over for the junction will take it from being “difficult” for people on bicycles to unsafe, contrary to national guidance and the assurance given by the Prime Minister himself. “We need to design cycling into our everyday lives. 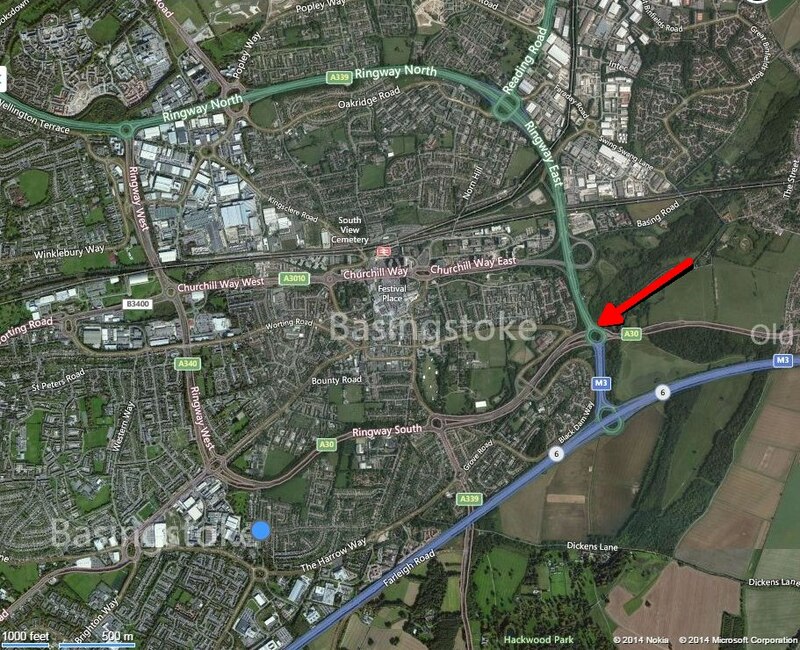 Like many successful towns, Basingstoke faces the big problem of road congestion. More than £30 million has been spent on improving the roundabouts for which Basingstoke is so famous. That money is there not to allow cars to move around more easily, but to reduce traffic congestion. The Mayor of B&DBC for 2014-15 is Cllr Roger Gardiner. As Mayor, I support all measures that seek to to improve road safety across the Borough. …I [am] sure you would agree that it would be preferable for cyclists to to avoid this very heavily trafficked intersection of the M3, A30 and A339. Cllr Gardiner stated that he has communicated the safety concerns with Hampshire County Council and Maria Miller MP in person. The Mayor suggested that people who choose to cycle or walk should use alternative routes through Eastrop Park and Basing Road; there is also a subway under the M3 motorway link road which connects with Crabtree Plantation. The Mayor was asked if Traffic Orders are to be put in place to restrict the use of the junction, and whether signposts will be erected to direct people to well-maintained, suitable alternative routes. In response, Cllr Gardiner admitted that “signage is not as good as it should be” and that he has contacted Richard Wareham, the Community Design & Regeneration Manager at B&DBC. Update 17 November 2014: The Mayor of B&DBC has been asked what the outcome of his meeting with Richard Wareham was regarding traffic orders; as well he was queried as to how much of the £10m funding was allocated to the 2 alternate routes he suggested. The example of a 55 year old cycling the 2.3 miles from Old Basing to the Council offices; and an 8 year old child cycling to the War Memorial Park to meet his friends; were given as examples. See Google maps below; or alternatively with CycleStreets. Streets should not be designed just to accommodate the movement of motor vehicles. It is important that designers place a high priority on meeting the needs of pedestrians, cyclists, and public transport users, so that growth in these modes of travel is encouraged. The underpinning principle is that measures for pedestrians and cyclists should offer positive provision that reduces delay or diversion and improves safety. Satellite view of the Black Dam roundabout in Basingstoke. Update 17 November 2014: Added maps showing alternate routes suggested by the Mayor of B&DBC. No body mentions building a bridge over this junction. How many miles detour do you expect walkers/cyclists to make when coming from A30/Old Basing and wanting to go to Harrow Way area. Were it not so normal for a Highway Authority you’d be forgiven for thinking this is complete sh¶t. Why on earth would you want to cycle this junction?? I grew up in that very area – always on a bike. The suggested alternative routes are completely fine. There really is no underlying need to cycle on a route that includes this junction, so the council here have made the right decision in not paying for “features” that have no benefit. The point is not ‘why would you want to use this …’, which is a pretty huge imposition on the old London road, but why should anyone not be able to take the route they know and understand, the ‘main road’. If Highways/the DfT or Highways Agency decide that there are too many cars (in a town like Basingstoke, designed to maximise car use, thats not surprising), so be it, do what you think best. But for those not in cars it is denying their rights as individuals to have a safe and reasonably direct journey. It would be rare to find off-route cycle paths of desirable quality almost anywhere in UK, and Pedaller suggests the alternative provision is inadequate. The more cycling )or even walking) is made insignificant by lazy, incompetent road designers – in the broadest sense – the more they will be scared into joining the high speed congestion, or killed. The designers are guilty of breaking the Equalities Act. Is there any experience of cycle design I must wonder see the photos at http://www.emhighways.co.uk/ Does anyone have any links to where the accessment from ‘difficult to unsafe’ came from? I’m lookign at a similar scheme in Slough http://slough-consult.objective.co.uk/portal/sbc/transport/transporty_schemes/a355_copthorne_roundabout/a355_copthorne_roundabout?tab=info that seem to think no cyclist (or pedestrian) is ever likely to be in this area. Its a great shame that they didnt take the chance to improve the junction for all users, before they started the work, I avoided this junction and chose either the underpass or the Eastrop routes. They were much quieter roads in terms of traffic and more pleasant. Having said that, its odd they didnt make it better for bikes to get around it, helping in turn motorists. Maria Miller in a recent email said “his Government’s spending on cycling has more than doubled since 2010, with £374 million committed between 2011 and 2015.” I can only guess by the state of the plans, roads and facilities, that this money is being spent elsewhere.